Everybody loves the sight of the White Cliffs as they return to Kent from a trip across the Channel, but there can be few who feel the same way about Burlington House and County Hotel. However, the end for these two Dover eyesores is now closer than ever. The Compulsory Purchase Order (CPO) recently confirmed following a public inquiry, now makes it possible for the plans for the St James’s retail and leisure development in Dover town centre to move forward. Dover DC secured the CPO from the Department for Communities and Local Government. This allows the council, and development partner Bond City, to complete the assembly of all outstanding third party land interests enabling the redevelopment of the St James’s area to move forward. More than 95 per cent of the freehold interests in the site were already owned or been acquired by the council by agreement, with the CPO requested to acquire the remaining land and interests. 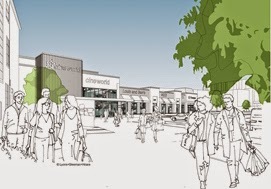 The redevelopment proposals, which will provide 120,000 sq ft of new retail and leisure space, have secured a number of high profile tenants, including Cineworld, Marks & Spencer, Travelodge and Frankie & Benny’s. The development as a whole is expected to bring much-needed private investment to revitalise the town centre and has been welcomed by many local businesses, including Dover Harbour Board.